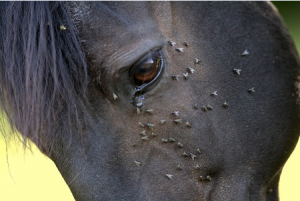 Flies are huge nuisances to horses, and unfortunately, there aren’t a lot of highly effective options available to farmers and ranchers to prevent these pests from bothering their horses. Fly screens and nets can be useful, but are often uncomfortable and unsettling to many horses, but as an article posted by Entomology Today points out, this is likely because horses are not raised as a food source, which means that they tend to get less attention when it comes to research funding. However, some recent work has been done on the use of wasps to stave off flies – and the method seems to be gaining ground. The currently trending idea is that wasp larvae, also known to the scientific community as pupal parasitoids, will attack and kill the eggs of house and stable flies, helping reduce their numbers before they’ve even had a chance to grow into a truly problematic population. The study, officially titled “Use of Pupal Parasitoids as Biological Control Agents of Filth Flies on Equine Facilities,” was published in the Journal of Integrated Pest Management. The lead researchers, Erika T. Machtinger, Christopher J. Geden, Phillip E. Kaufman and Amanda M. House, performed successful lab tests that showed that using wasp parasitoids could be very successful in fly prevention, but it’ll need to be tested in the real world before they will know for sure whether it will work. The study also gave horse owners a few steps that they could take in the meantime while this theory is still being tested. If a fly problem is severe in any part of the property, the first thing you should do is identify the species of fly because, as you might guess, different fly species require different control methods. Tracking the problem and learning the population fluctuations can help determine the scale of the problem and guide the decision-making process when it comes to choosing the best solution. Count the number of flies on your horses’ legs each day for a month, and take note of the shift in numbers. The parasitoids method, like the one this study is researching, should be used frequently, but check with an expert to determine the exact number of parasitoids your barn requires and when you should use them, as this will depend a great deal on the life cycle of your flies. Switching from hay to sawdust or gravel can also aid in reducing the fly problem, as most fly populations thrive in hay. Keep these tips in mind for fly prevention at your barn, and keep an eye on the results of the ongoing research to be published. Many ranchers could definitely benefit from finding a reliable and trustworthy solution to help make lives of their horses – and themselves – more comfortable and fly free. At Deer Creek Structures, we can also help you ensure your animals stay comfortable with our great selection of animal barns and sheds. For more info on training your horse and other tips on proper horse care, check out more blog posts from Deer Creek Structures. To learn more about our available structures, give us a call today at 254-546-2276.